Containing 182 fossil teeth, including four of the largest teeth ever discovered. Each of the four largest teeth measures over 7 inches, with the largest tooth measuring 7 5/8 inches. It is believed that in life, this shark would have measured over 75 feet in length. The jaw is a reconstruction, modeled after its closest living relative the great white shark. Measuring 9 1/2 feet high x 11 feet wide, containing four rows of teeth. It took Vito Bertucci, known as the "Megalodon Man", about 20 years of work to get an entire set of teeth for the gargantuan Miocene shark Carcharadon megalodon. Vito scuba dives for these fossils and frequently encounters modern sharks and alligators while collecting. He has appeared in a National Geographic special for his efforts in reconstructing the biggest JAWS ever to haunt the ocean depths. Estimated value: 1.2 - 1.5 million dollars. A massive 7 1/4 inch serrated shark tooth was found in a coastal river bed in South Carolina by fossil hunter Vito Bertucci. 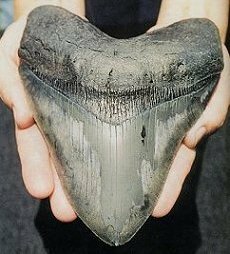 The fossilized tooth belongs to carcharodon Megalodon, a prehistoric 70-foot, 70,000 pound version of our modern-day Great White. To locate the tooth, and hundreds of smaller ones like it, Bertucci had to battle Tiger and Bull sharks, alligators, cotton-mouth snakes, sea wasps (jelly fish) which can carry fatal stings...all in water that is usually pitch black and filled with strong currents. A good freind that alot of people are going to miss. After nearly a week of searching, the Bryan County Sheriff's Office says a fisherman discovered the body of 48-year-old Vito Bertucci of Port Royal Thursday morning when it surfaced in Ossabaw Sound in Chatham County. The Coast Guard says 48-year-old Vito Bertucci from Port Royal went diving in the Ogeechee River near the Intercoastal Waterway in Bryan county about 2:30pm Sunday and told his partner he would surface in about 2 hours, but never came up. The Coast Guard says the friend in the boat reported the diver missing about 5:00pm Sunday. Search teams with the Coast Guard, Georgia Department of Natural Resources and Chatham and Bryan counties scoured the water for him Sunday night and Monday. The Georgia Department of Natural Resources, Bryan County Sheriff's Office Marine Rescue Squad and a Beaufort Volunteer Dive Search crew continued looking for Bertucci Tuesday, Wednesday and Thursday. 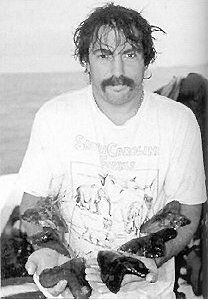 Local divers say Bertucci is an experienced diver, and he was collecting artifacts for a museum he operated in South Carolina. Some divers also say he took a deadly risk diving in a 10-feet current. Dive teams say it was an exhausting search in the Ogeechee River, in an area one diver described as a black hole. "There's a deep hole there and there's a lot of debris in that area. There are trees and what not, nets and stuff, crab traps and crab floats, that type of thing. Anything is possible," said Sgt. James Shelton with GADNR. The DNR says Bertucci was looking for sharks' teeth and whale bones and he was wearing weights so he could search the bottom of the river more easily. He was searching in what divers call black water. With all the sediment churned up, divers say it's a very dangerous experience because you can't see anything, leaving divers to feel their way around. "You can't see anything except what's underneath your light on your belly," said Ralph Neely, a master diver trainer with Zero Gravity in Savannah. Neely says he knows Bertucci, and he was weighted down with more than 140 pounds of equipment. "This man's never going to float, not going to happen," said Neely. Neely says with 30 years diving experience he would have never gone diving in Sunday’s 10-feet current. Neely says he’s gone looking for artifacts himself and loves the thrill of discovery. "You find these things between 8 and 11 million years old, that's fascinating. It's not eccentric. It's addictive," said Neely.